I did it!!! I bagged my 15th peak in 2015 a few weekends ago… and to make it even more special, it was on my bday! Happy birthday to me! When I set a goal earlier this year to summit 15 peaks in 2015, I wasn’t really sure if it would happen. In fact, there were times when I thought it would be downright impossible, but one by one, I started to check them off. When I climbed to the top of the Sierra Buttes on Halloween, I checked the final one off of my list for the year. I got it just in time, too, because the past few weeks in Tahoe have been pretty snowy and it would have been a challenge to try and get any more in. So… the Sierra Buttes! I picked this as the last one of the year because it is one of the most picturesque peaks in the area that I could think of. The 360 degree views from the top are absolutely stunning. To get there from North Lake Tahoe, take Highway 89 North from Truckee. Follow 89 through Sierraville and then take a left onto Highway 49. Stay on 49 for about 17 miles until you see a sign for Gold Lake. Take a right on Gold Lake Road and it will veer to the left. Stay on this road for a couple of miles until you see a sign for Packer Lake. Take a left and follow the signs for Packer Lake. Soon you will see a sign for the Sierra Buttes. Follow this and the pavement will soon give way to a gravel road. After a few hundred yards, you will see the trailhead. From Incline Village, it took us about an hour and a half to get here. If you have an off-road vehicle you can continue on the Jeep trail for a ways until you reach Packer Saddle. Note: The road is pretty sketchy in some spots. Don’t think that you are going to do this in your Subaru. You seriously must have an off-road vehicle. We did this and didn’t really know where we were going, so we decided to turn around and go back to the main trailhead. If you reach Packer Saddle in your Jeep or truck, it will cut about a mile and a half off of the hike. Going back to the main trailhead, we started the hike. It is about 3 miles to the top and it is mostly an unforgiving uphill trek the whole way. There aren’t many sections where it is super steep like some of the others I have done, but it is a constant grind. There are a couple of forks in the trail, which are mostly blocked off by logs. Make sure to look for the logs and stay on the trail to the summit or you might find yourself scrambling up some scree. 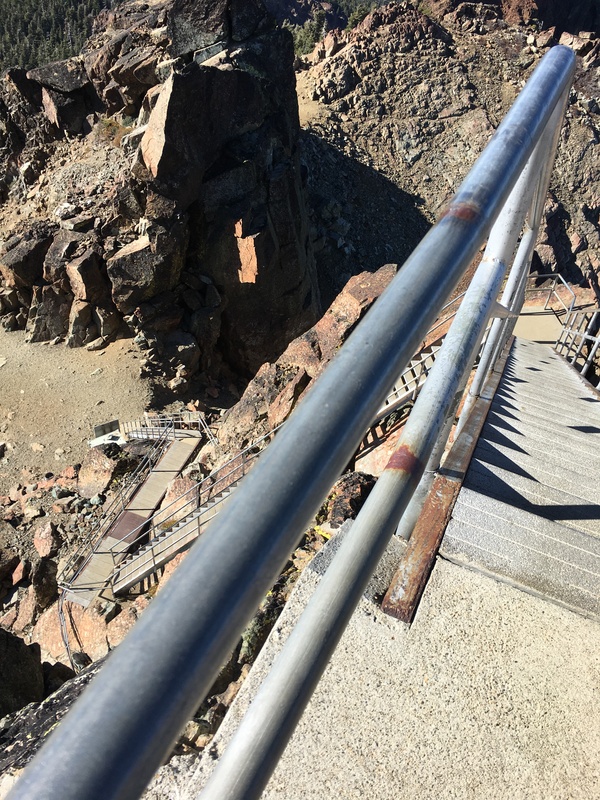 Stairs leading up to the top of the Sierra Buttes lookout tower. Looking down the stairs once you get to the top of the longer flights. 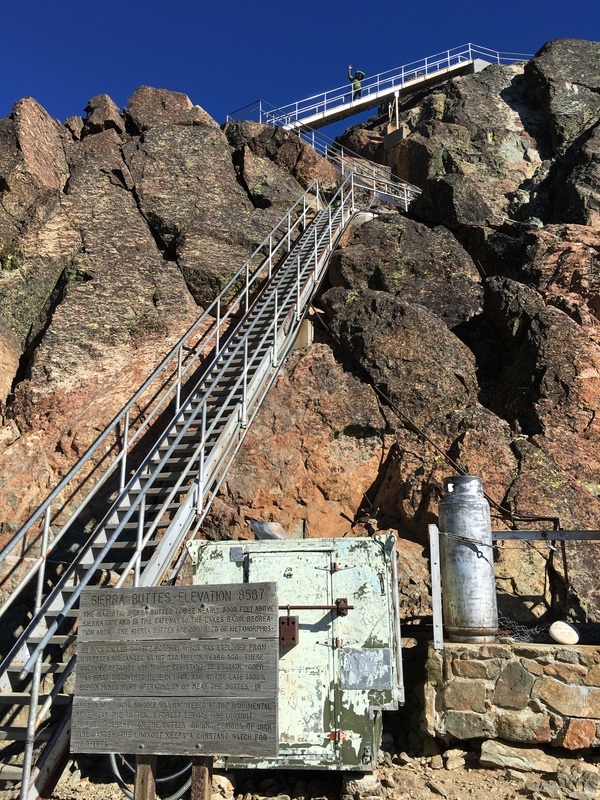 Once you get to the top, you will see some of the most “interesting” stairs you have ever laid eyes on. If you are afraid of heights or have a dog with you, think again. I can’t imagine trying to do this with my dog. There would be just no way. 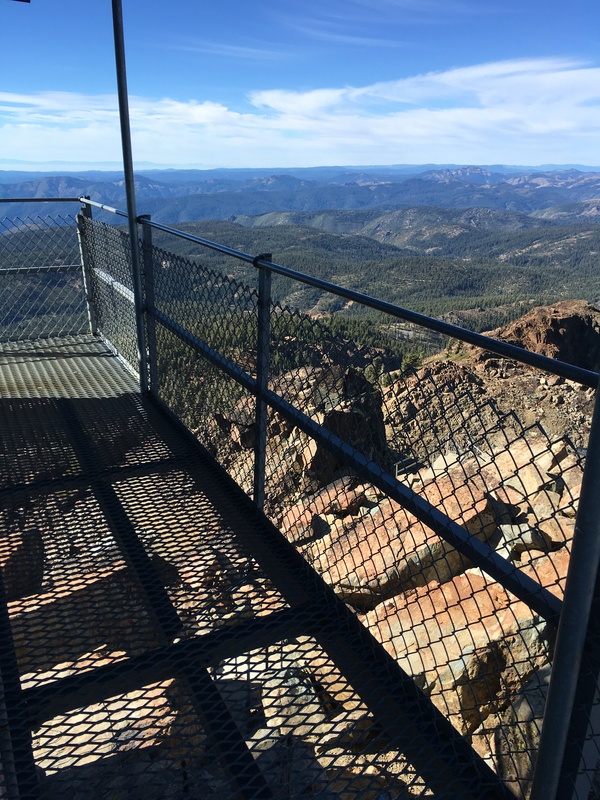 After three flights of precariously placed stairs, you will be at the bottom of the lookout tower. One more short flight of stairs, and you will be rewarded with some amazing views of California and Nevada. When we get got up there, it was crazy windy, but we were able to find a little bit of shelter on one of the sides of the lookout. View from the lookout tower on top of the Sierra Buttes. There were quite a few people coming and going when we were up there, but we hung out long enough to have the whole place to ourselves for a short while. That meant popping the top on a bottle of champagne that we brought with us. I’m surprised that I didn’t get any in my face, because it was super windy, but so worth it. 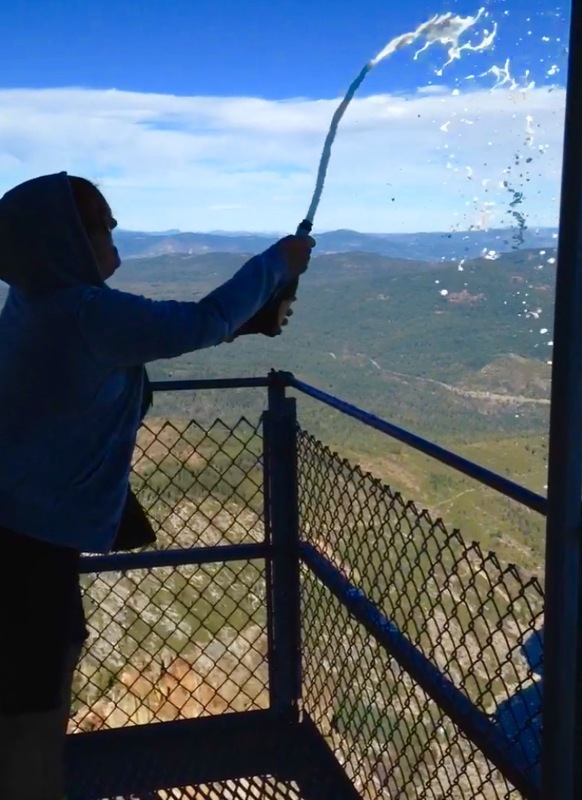 Enjoying a bottle of champagne (or just spraying it all over) from the top! At the bottom of the stairs, there is a sign that explains when and why the lookout was built. You can read all about it in the picture below. Although it says they use it for watch during high fire seasons, it doesn’t look like it has been used in years. It is still pretty amazing up there though. I would highly suggest this hike for anyone who wants to see some amazing views. It is relatively short, not super steep, and will take your breath away. 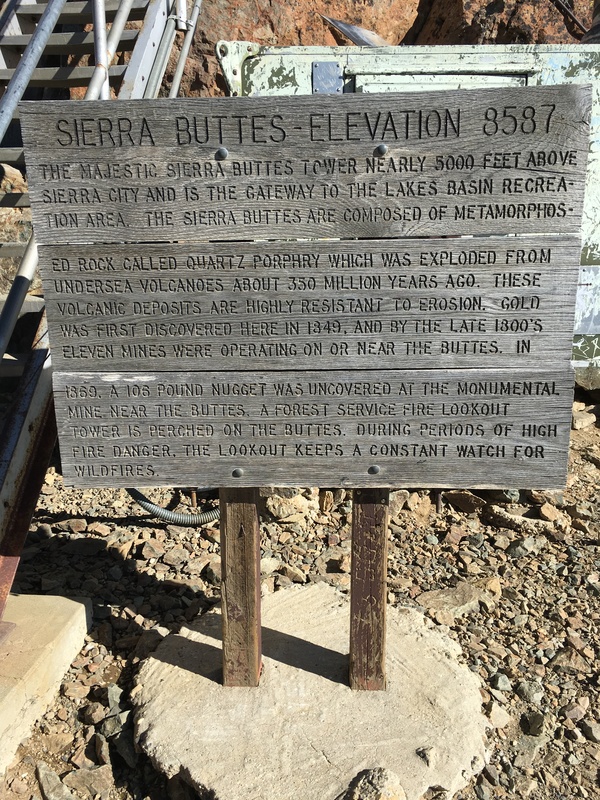 Sign explaining the history of the Sierra Buttes at the bottom of the stairs. Total Distance – 6 miles from the main trailhead or 3 miles from Packer Saddle if you off-road. Pros – Relatively short and moderate trail. Easily accessible with beautiful views. Cons – Not advisable for dogs or those that have a fear of heights. You can forego the stairs at the end if you fall into either of these categories, but you will be missing out on some spectacular views.